dolls yet? In the summer we held a multi-family yard sale and Lou absolutely fell in love with one of the dolls one of the other families was selling. Lucky her, she had 50 cents to buy it! Since then it has been the coveted toy around here. All the girls think they are great and thanks to Maisy's birthday we've recently added a couple of the mini dolls to our collection. They are packaged in a tiny cardboard house, but the houses haven't withstood my girls' play so we decided to make them a home ourselves. 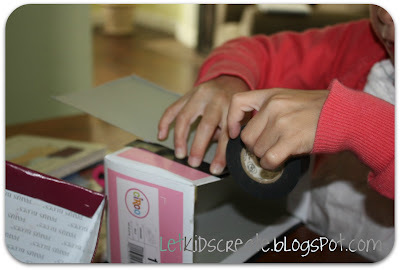 We just used shoeboxes, scrapbook paper, foam stickers and other "junk" we had lying around to make them. Here's some shots of what they worked on all Sunday afternoon. Lou decided her house needed a patio. The window is just right. get stuck in it, but it's perfect for their little pets. 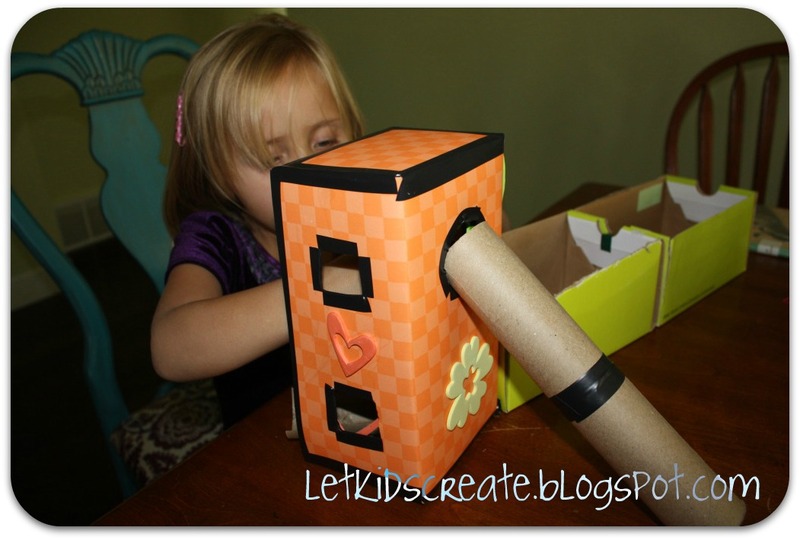 I love the little bed - a toilet paper tube cut in half. Lou taped a flameless tea light to the roof. they worked really hard on this most of the afternoon. 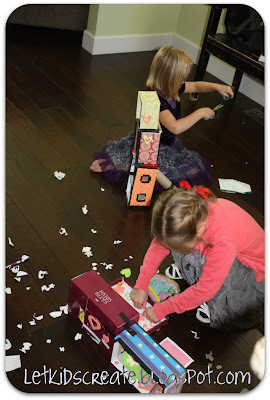 My girls have really been into making things from boxes lately. Linked to Crafty Moms Share. 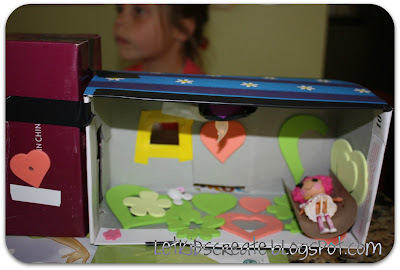 I spent hundreds of hours as a child, making shoebox houses and furniture and inventing stories for my dolls. Your kids have obviously had a wonderful and creative time! Lovely! I'll pin in my Pinterst board on carboard boxes crafts. Thanks for this idea. Oh my, what a sweet dolls house. I am currently ahem working on one for my little girl..and I think I may be overcomplicating it all and making it too clever. Yours is just perfect! 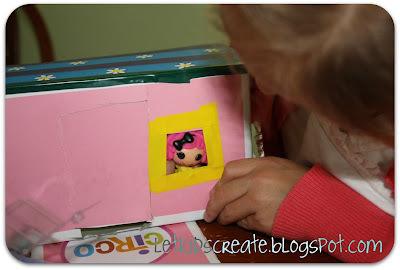 We have been making boxes into mailboxes for a pen pal program at the library and also have made them into forts for action figures. Very cute!! I personally love building dollhouses but most of mine are from kits. 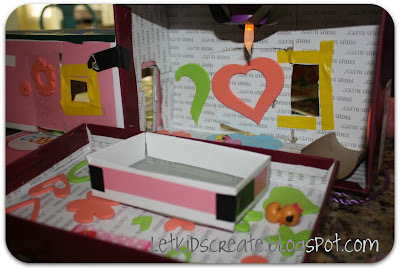 I would love it if you would share this at http://craftymomsshare.blogspot.com/2011/11/sharing-saturday-4.html. Thank you! HI! I'm your newest follower! 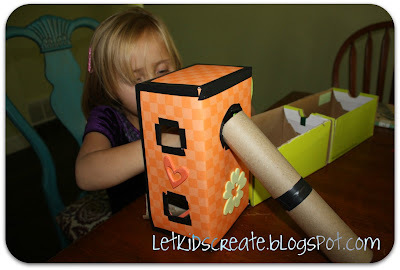 I just found you through the Crafty Moms Share Linky Party. I have an almost three year old who would LOVE this! Please stop by my blog as well, I would LOVE to have you! I'm a speech pathologist turned mama blogging about great language activities. Have a great weekend! they did such a great job! 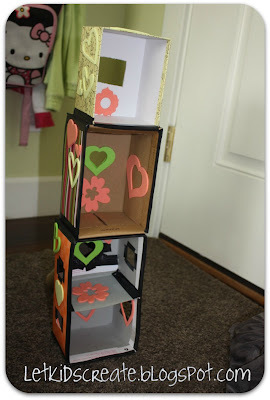 :) I keep trying to save boxes to do something like this w/my girls and my hubby keeps recycling them. Yay- you will be featured this week on The Sunday Showcase ! WTG and don't forget to grab your button!